For a medieval soldier, a good shield was often the difference between life and death. This Fleur Cross Medieval Round Shield brings to life the wheel-shape of the shield, with subtle touches of detail that make it a defense for any warrior to favor. The shield is altogether classic and iconic in its design, and is fully functional in its make. 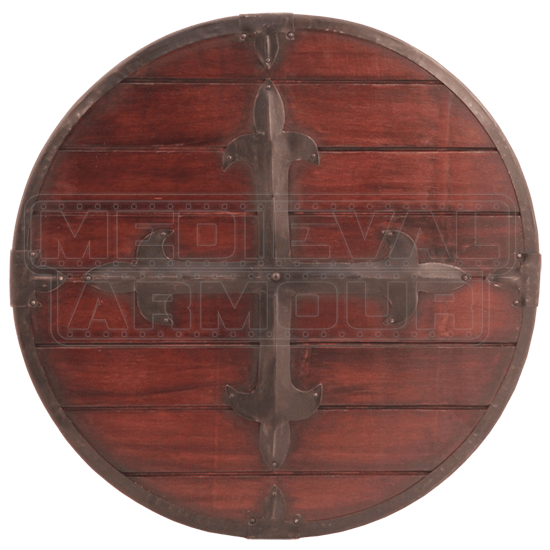 Crafted from hardwoods and set with a metal rim, this shield is fully capable of deflecting blows and parrying strikes, making its wielder that much more defensively sound when it comes to combat on the field of medieval battle. The center of the shield is set with a cast-iron cross pattern, as opposed to a central boss, which features fleur de lis shapes at each terminal. The shield possesses a 24 inch diameter, as well, which offers plenty of size for a good defense, while still being small enough to make the shield, and the warrior carrying it, rather maneuverable, too. The round shield was a classic part of any warriors defense in the early medieval era, and now, as this Fleur Cross Medieval Shield, it can be a part of your battlefield defense, too!